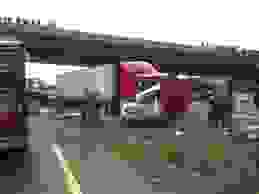 CALIFORNIA COMMERCIAL TRUCK ACCIDENT: Why are bodily injuries more common in a California truck accident than one involving only passenger cars? It has to do with the fact that commercial truck vehicles are much larger and heavier than a passenger car. A typical fully-loaded large commercial truck can weigh 80,000 pounds or more, while an average passenger automobile weighs approximately 3,000 pounds. Due to this size disparity, and the basic laws of physics, any collision between a commercial truck and another vehicle is likely to result in serious, even fatal, injuries. California freeways are extremely busy with commercial trucks because of the large sea ports located up and down its coastline.